Year of the Woman: These five Democratic women were elected (re-elected, in the case of Mikulski) to the Senate in 1992, joining in the Senate chamber Nancy Kasselbaum, a Republican elected in 1978. 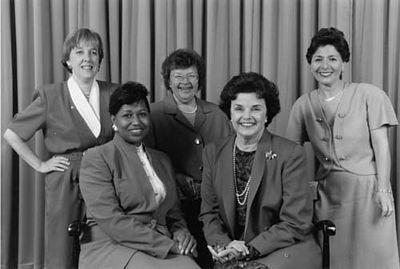 From left: Patty Murray, Carol Moseley Braun, Barbara Mikulski, Dianne Feinstein, and Barbara Boxer. The impetus for this sudden surge may have been the Clarence Thomas Supreme Court confirmation hearings. In October of 1991, when Anita Hill appeared to testify about her sexual harassment experiences with Thomas, millions of Americans sat riveted before their television sets. Angry and frustrated women kicked their TVs and then organized. Pink buttons sprung up with the logo, “I believe Anita Hill.” In spite of the charges, Thomas was approved. Congresswoman Barbara Boxer and six of her House colleagues marched up the steps of the Senate to protest the actions of the Judiciary Committee. The hearings with the all male members committee symbolized the lack of power and representation women had in the U.S. Congress. Since that watershed year of 1992, the number of women in elective office has not increased. Now, 20 years later, the United States ranks around 70th among countries in electing women to national office, according to the Inter-Parliamentary Union of Women in National Office. Of 535 congressional seats, only 90 are held are by women in 2012. In the U.S. Senate, women hold 17 percent of the seats and in the House of Representatives, 16.8 percent. Since 1992, the number of women in the U.S. Senate has gone from six to only 17 members. Nationally, women hold only 23.6 percent of state legislative offices and 22.7 percent of statewide offices, yet make up over half of the population. Although California has two women U.S. Senators, the situation remains static on state and local levels. Despite being the majority off the population, women hold 28 percent of the seats in the California State Legislature (slightly above the national average) and 24 percent of seats on county boards of supervisors. Does it matter if women hold political office? Is gender equity necessary in our legislative bodies? Yes, the very definition of our democracy is equal participation and equal representation in our society. In addition, there is a pressing need for women to be involved in the electoral process because issues affecting them continue to remain prevalent in the public arena. On the health care front, the “war against women” continues. The recent debate in Congress on funding for contraceptives and the lack of women’s presence in these hearings reveals the urgency for women to participate in the development of policy and in the legislative process. The hearings were a painful reminder of the Anita Hill interrogation 21 years ago. Women make a unique impact on public policy. Research reveals that women are more likely to carry legislation that improves the lives of women and families. This recent commentary by Tony Dokoupil describes the effectiveness of women in Congress and their greater performance than their male counterparts. So if women are effective legislators why do the numbers of women in office remain consistently low and why don’t more women seek elected office? The answers can be found in the book “It Takes a Candidate,” by Jennifer Lawless and Richard Fox. The authors conducted a national survey of 3,800 eligible candidates to determine how “gender affects political ambition.” Lawless and Fox concluded that women focus first on raising their families and building their careers before choosing a political path: Women are reluctant to run and less likely than men to think they are qualified for office; and they are less likely to be recruited by their political parties. And if women don’t run, then they don’t win. Local and national organizations are actively recruiting women and trying to close the gender balance gap. One of the newest and most aggressive efforts is The 2012 Project. Created by California political advisor Mary Hughes and sponsored by the Center for American Women and Politics (CAWP) at Rutgers University, the goal of The 2012 Project is to increase the number of women in Congress and state legislatures. The 2012 Project is a non-partisan national campaign with a unique approach. The campaign strategy is to “identify and engage accomplished women 45 and older from under represented fields and industries” to run for office in 2012. Why 2012? Following the 2010 census, reapportionment created newly designed state and federal legislative districts. This has resulted in more open seats and new candidacies. “The 2012 election presents a once-in-a-decade opportunity to add significant numbers of new women to Congress and the state legislatures, and The 2012 Project aims to take advantage of it,” says founder and director Mary Hughes. The 2012 Project plans to reach out to women in professions not currently represented in State Houses and Congress. These industries, which include areas of “finance, science, technology, energy, health, environment, small business, and international affairs,” have specific expertise for policy making. Recruitment will occur at annual meetings, conventions, and seminars sponsored by industry groups, labor organizations, and professional associations. By connecting women interested in running to “leadership institutes, campaign boot camps, fundraising networks, and think tanks, the 2012 Project provides a road map to a successful candidacy,” says Hughes. For the last 23 years, The Santa Barbara Women’s Political Committee (WPC) has worked successfully to elect women to public office. As a result of these efforts, women in public office are the norm in Santa Barbara County, not the exception. Locally, we have created a successful model but, as statistics have shown, this is not true statewide or nationally. On March 16, the Presidents’ Circle of the WPC will hold its annual luncheon at the Montecito Country Club. Mary Hughes will be the featured speaker and will discuss the current state of women in elective office and the work of The 2012 Project. What are the results of their efforts and where do we go from here? Join us for a national update. The luncheon will be held from 11:30 to 1:30, Friday, March 16. Reservations can be made at sbwpc.org. 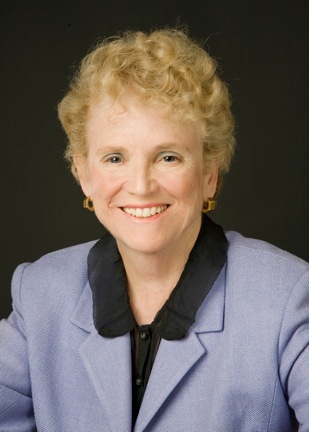 Susan Rose served two terms on the Santa Barbara County Board of Supervisors. She previously served as executive director of the Los Angeles City Commission on the Status of Women and was a co-founder of the Santa Barbara Women’s Political Committee. Currently she is a member of the Antioch University Santa Barbara Board of Trustees where she is developing a leadership program for women.